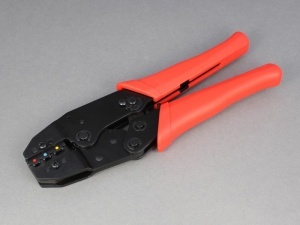 Standard duty (frequent use) ratchet crimping tool for crimping of all pre-insulated terminals (red, blue, yellow). Colour-coded dies (red, blue, yellow) for different terminal sizes. 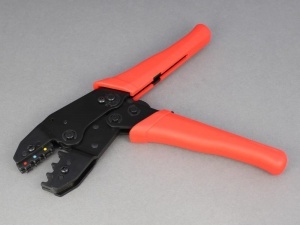 The ratchet mechanism ensures that the jaws of the tool are not released until a full crimp has been applied to the terminal. Features spring return and adjustable crimp pressure via dial setting on ratchet mechanism. Don't know why I didn't buy one years ago! 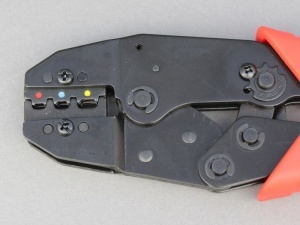 After years of using the cheapy-cheapy crimpers this is a joy to use and gives confidence in a good connection that the others just never gave. Should have bought one years ago. The wide jaw surface makes a good strong crimp, at least twice the crimped area of cheap crimp tools. I bought this after struggling with mole grips and pliers. Why did I wait? This makes a neat and secure job of every crimp. Terminal for the mole!